Sure seems that Saturday, besides giving Ohio State fans quite a bit of heartburn, opened up more questions that they answered. What did we learn in the 27-22 escape from the Toledo Rockets? First, I had thought that all the announcers saying that "Toledo is no Akron" and that we should expect a tougher matchup for Ohio State this week was all just hype, trying to maintain ratings and excitement in these in-state games that are normally yawners. But not so. 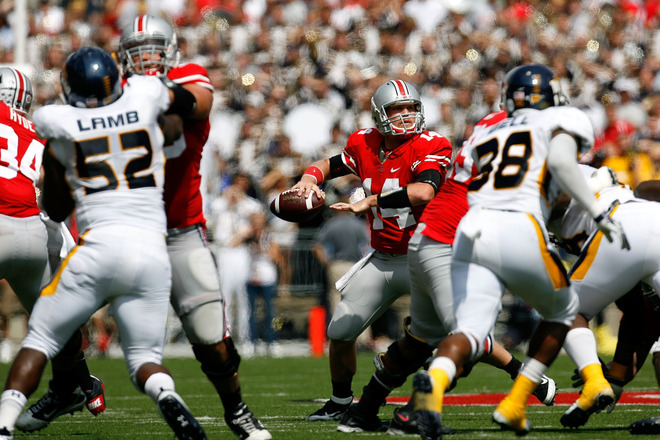 Sure, Toledo might lose 9 out of 10 to Ohio State--but they would be closely fought games. Over and over again, Toledo sprung a good play, or came away with a great defensive play. Good team. But penalties and big Ohio State plays finally did them in. By the way, I'm guessing Toledo could handle both Michigan or Notre Dame. Definitely plays better defense than either of them. Still, that is an impressive team with some real talent and speed. Good on 'ya. Second, a coming out party for sure for Carlos Hyde, as he ran for two nice touchdowns, including one long one in the first half when Ohio State first started feeling a little nervous and desperate for offense. I need to see him a lot more, obviously, but something about Hyde just makes me think he doesn't have that burst to be able to break free. I wonder what his 40 time is. Is there anything we can type things into to get answers? Oh who knows, It's too late. Finally, the Ohio State quarterback position. On paper, Joe Bauserman had good games last week and this. Last week: 12-16 for 163 yards, three touchdowns and no INTs. I was feeling he looked like another Joe Germaine, just hitting his targets whenever he wanted. This week--not so much. At least if you watched the game, or look closer at the stats. Still no interceptions, but it just seemed Bauserman was off all day long, though some credit must be given to Toledo, who definitely made a couple fantastic plays in the defensive backfield. Overthrowing by 10 yards, underthrowing by 2 yards, it just wasn't there for him. He ended up throwing for only 25 more yards (189) on 14 additional attempts (30 with 16 completions), for a touchdown and no INTs. Not terrible, but his play was a big reason the game was so close. And the announcers (and talking heads) were again talking about Braxton Miller, as if he were a pouting child. On Saturday he didn't see a minute of work. I was incredibly surprised, and OSU coach Luke Fickell said it was a in-game strategy decision. Whatever. Looked to me like Miller was with the other quarterbacks, not sulking on the bench like Jay Cutler. He didn't have headphones on, fine. I gotta think that if Fickel wanted him to have headphones on, he would. This has to be an invented controversy, right? Our freshman stud can't be unhappy after two nonconference games, can he?